This post was written by Seprix with a little help from the Dominion Strategy blog team. We’ll be publishing more overviews of Renaissance cards over the coming months; if you’d like to contribute, check out the Articles section of the Dominion Strategy Forums. Recruiter is a $5 cost Action that draws two cards, trashes a card, and then supplies as many Villagers as the cost of the card trashed. Bearing strong resemblances to Masquerade in both similarity and power level, Recruiter is already considered to be one of the strongest cards in Dominion. Firstly, Recruiter has a leg up on other $5 cost trashers (Junk Dealer, Upgrade, etc.) by virtue of drawing an extra card, which provides both more flexibility in trashing as well as cycling. If Recruiter draws Copper and Estate in the early game, it could be thought of as providing a virtual coin, much like Junk Dealer. However, unlike Junk Dealer (and most trash-from-hand cards), Recruiter does not decrease handsize, which is a valuable trait. As if that wasn’t good enough, Recruiter is also one of the best Villages in the game. 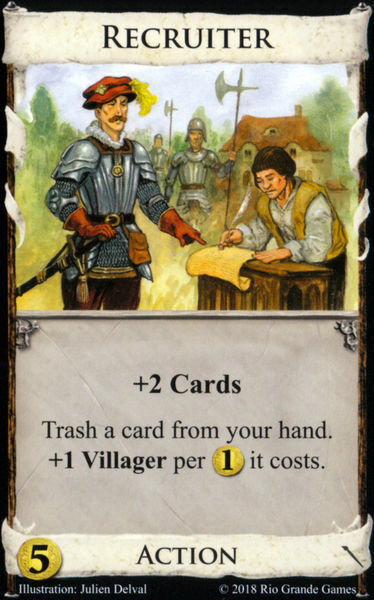 Playing a Recruiter and killing an Estate provides two Villagers, which can be distributed to mitigate collisions and play more aggressively. The effect can be likened to a more flexible Encampment. If Recruiter has more expensive cards to trash throughout the game, it can serve as the primary source of extra Actions for a deck. Recruiter is a versatile card that provides several effects that by themselves are good, but added together make for one of the strongest cards in the game. If you see Recruiter on the board, it is almost never wrong to pick one up. The earlier you do, the better. This entry was posted in Articles, General Strategy, Individual Card Analysis, Renaissance, Uncategorized. Bookmark the permalink.